Barco Pump offers all the necessary components for your pump including suction hoses, layflat discharge hoses, rigid discharge hoses, valves, manifolds, and flow meters. Let Barco Pump be your one stop shop for all your pumping needs. Barco Pump offers a wide variety of HDPE pipe from 4” all the way up to 42” for rent when hose is not a viable option. 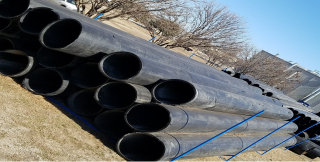 We have 22.5, 45, 90 degree elbows in all sizes along with tees, wyes, and manifolds to meet the rental needs of our customers.